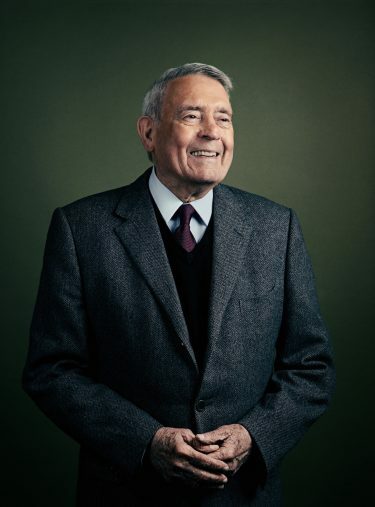 Our editor reflects on meeting one of his journalism heroes, Dan Rather, during the legendary newsman's visit to the UW. I thought I might never wash my right hand again. That's because I had the opportunity to shake hands with one of my heroes: Dan Rather. The Dan Rather. The legendary former CBS newsman stopped in the Emerald City to promote his latest work, "What Unites Us: Reflections on Patriotism," for a UW Book Store event. Hundreds of us who grew up watching Rather deliver the news every weekday night in our living rooms overflowed the hall at University Temple United Methodist Church in December. A heartfelt standing ovation greeted him when he and interviewer Terry Tazioli took the stage. Seconds later, zillions of cellphones came out from the sellout crowd to document the thrill of being in the same room with one of broadcast journalism’s heroes. “Thank you for the warm welcome,” Rather said. Yeah, I know how Rather fell from grace at CBS. But still, it was Dan Rather. And what I thought was so interesting was that, even in this tumultuous political time, he came to deliver a positive message about patriotism, of all things. Now, he did admit, “This is not a book I could have written at any other stage of my career,” noting the drastic and rather nasty change in today’s political atmosphere after the 2016 presidential election. “During the election,” he told the crowd, “people said they were afraid for the country. That was the first time I had heard that.” This from a man who has covered assassinations, natural disasters, wars, Watergate and more. He explained that he also was taken aback by the phenomenon of social media, which allows people to vent and share and lash out without the need to provide any sense of perspective or context. Calling this the most personally intimate book he has ever written, Rather drew upon his childhood growing up in Texas. One of his main points was to reassure the crowd—and his readers—that the United States has overcome other periods of great division: the 1960s, the calamitous Civil War, Watergate. “We always came through it,” he said. For me, the chance to hear Rather speak and meet him in person was a dream come true – and a really eye-opening experience. In the hours before the program began, I waited in the area in the church designated as the “green room,” where colleague Quinn Russell Brown was setting up a couple of backgrounds so we could photograph Rather. While we fine-tuned the lighting, we heard voices in the hall. Immediately, that recognizable voice stopped me in my tracks. “That’s Dan Rather!” I said to anyone nearby. Dressed in a suit and sweater vest, the 86-year-old newsman turned the corner and there he was. I introduced myself and told him that he was one of the reasons I got into journalism in the first place back when I was a high schooler in Southern California. What he struck me was how friendly and down to earth Rather was. He warmly greeted us and the other folks from University Book Store, including CEO Louise Little, ’81, who joined us in the green room. We knew we were in the presence of journalistic royalty, and someone who had the gravitas to deliver a message that might not have occurred to us that mid-week evening. And beyond his message, he offered us lessons that rang true.